Allan Kaprow was so far ahead of his time it staggers the mind. As far back as 1957 when he was taking John Cage’s classes at the New School for Social Research, he embraced the importance (and yes, the need) of sound and speech and time and performance. In his classes, Cage unleashed a new form of indeterminacy among the visual artists in New York that would completely radicalize their practice. He contributed (most likely inadvertently) to the birth of the Happenings and Fluxus and NY performance, which transformed the scene by the early 1960s. The American avant-garde was radically loosened and separated from the previous leading edge of abstract expressionism. Many in NY were sent kicking and screaming at the embrace of interdisciplinary art that would evolve throughout the 1960s. This was nothing less than the birth of multimedia as we know it today. Kaprow’s bold statement surrounding the delivery of text is profound in the face of what would surface in the NYC avant-garde, stretching south to Provincetown and east to Germany, where the emerging artists and the unheard of new movements of the Happenings and Fluxus were waiting in the wings. The simplicity of Kaprow’s statement, pointing directly to the spoken word, situated this new radicalization where it most counted: the poetic utterance of speech. For Kaprow, everything emanated from there: audio recording, projections, film, gesture, mime, assemblage, collage, paint, makeup, noises, time, fabrics, junk, machines, and raw energy, the list goes on. 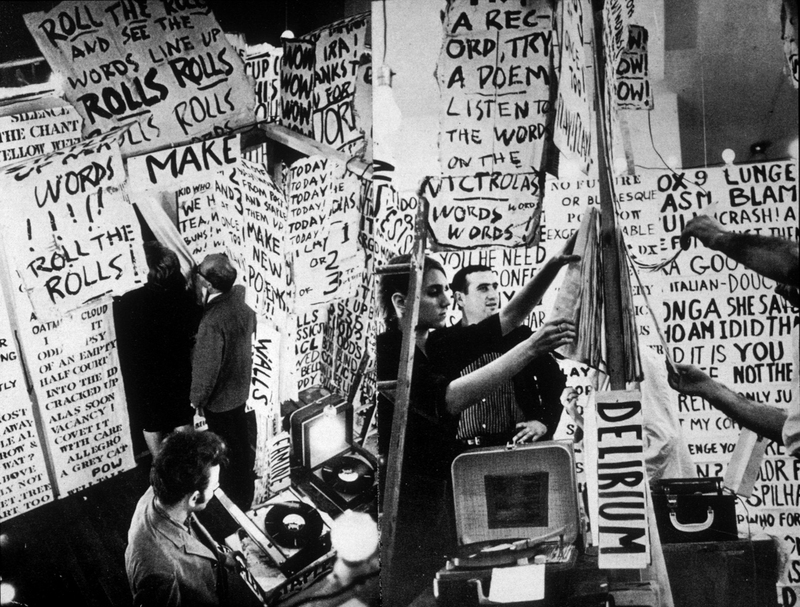 Kaprow understood that everything and anything could function as material for art, Words, the complex environment he created in 1962 at the Smolin Gallery in NYC explodes the written word. Here he transformed the audience into participants: there was no longer any such thing as an audience, no longer performers, but rather, all collectively became participants in the unfolding experience of the work. And yes, this was 1962, and quite possibly the first time an interactive artwork was presented in an American gallery. In today’s artistic milieu of the hot buzzword of relational art, Kaprow was inventing something completely fresh that seemingly came out of nowhere. The only guide could have been the specter of anarchy, where else could this scripted chaos have come from?